After slogging through an ugly first half, Syracuse used two second half runs, including a late 19-2 burst, to pull away for a 62-47 win over Eastern Michigan at the Carrier Dome on Wednesday night. The Orange held the Eagles without a field goal for over nine minutes to put them away and close the non-conference portion of their schedule with an 11-2 record. The loss drops EMU to 8-4 on the season. SU could hardly find the basket in the first half, shooting only 23.8 percent before the break. They turned it on late, making 52 percent from the field after intermission, including six-of-nine shooting when they pulled away over the final ten minutes. The defense also was stellar in that finishing kick, holding the Eagles without a basket from the 10:28 mark until there was only 1:23 left in the game. After being outrebounded in the first half, 19-16, Syracuse doubled up the guests on the glass in the second session, claiming a 22-11 advantage. Paschal Chukwu, who set career highs in scoring and rebounding on the night, was a driving force, as he nearly had a double-double in the second half alone with eight points and nine rebounds. After a slow three minutes, Eastern Michigan owned the opening of the game. In an early 5-0 hole, the Eagles broke out with 11 straight points to take a six-point lead with the game barely six minutes old. EMU would eventually push the margin out to seven points with just over nine minutes left in the opening half. SU would wipe out that lead with seven straight points. Frank Howard rattled home a three-pointer to start the span. Tyus Battle and Paschal Chukwu would each add a pair of foul shots on the subsequent Syracuse possessions to knot the game at 15 a side. The Eagles struck back with a three-pointer, but the Orange replied with six more points. Chukwu added two more free throws, then Oshae Brissett made the front end on a trip to the line. Howard then stole the ball and dribbled downcourt, only to pull up and swish a three for a 21-18 SU lead with just over five minutes left in the first half. Eastern Michigan would chip away at the lead, eventually scoring just before the buzzer at the half to send the squads to their respective locker rooms at 24-24. The Eagles would tie the score again at 26 in the opening moments of the second half, but Syracuse ran off a 7-0 run to take the lead for good. Chukwu started this stretch with another pair from the charity stripe. Howard then took over, powering through the Eagles’ defense for a lay-in, then swishing another three for a 33-26 lead. Tyus Battle then got hot, keeping the Orange afloat for the next several minutes in spite of their suddenly leaky defense. Battle, who had struggled through a poor first half (six points on 1-of-6 shooting, including missing all five of his three-point attempts), hit a pair of triples off Howard assists to stretch the lead to nine points. He then added two jump shots, but the second was the only SU tally during a 9-2 Eagle run that brought the guests within 43-41 just before the midpoint of the second half. Finding themselves in a one-possession game, Syracuse came to life with a half dozen points. Once again, Chukwu started things with two foul shots. Brissett came in on the right baseline for a short bank, then Marek Dolezaj and Battle each added a single free throw for a 49-41 lead. Following a pair of Eastern Michigan foul shots, Dolezaj made a slick no-look bounce pass to Chukwu for a dunk. On the next possession, Howard made a deft pass to Brissett for his two-hand slam, a 53-43 SU lead, and an EMU time out. 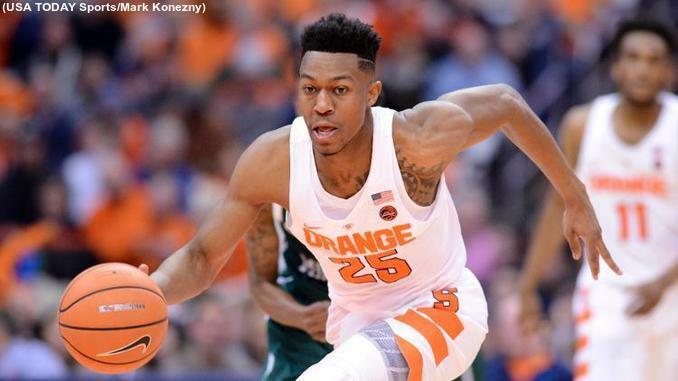 The break offered no respite to the Eagles, as Syracuse piled up nine more points. Battle chased down a loose ball and drove for a lay-up, then drained a triple off a Dolezaj kick-out. Howard then set up Dolezaj for an easy score and Chukwu tapped home a miss to make it a 62-43 game with just over two minutes left. Tyus Battle went off in the second half, hitting 6-of-9 from the field, including 3-of-4 from deep, as he rolled up 16 of his game-high 22 points after the break. Paschal Chukwu had a career night, setting personal bests with 15 points and 12 rebounds while also blocking five shots. Oshae Brissett logged another double-double with 11 points and a dozen boards while Frank Howard hit a trio of treys for most of his 11 points to go with seven assists and four steals. Elijah Minnie led Eastern Michigan with 13 points. James Thompson IV fell just shy of a double-double, finishing with 12 points and nine boards. Paul Jackson chipped in with ten points. Syracuse will close 2017 by opening Atlantic Coast Conference play on New Year’s Eve against Virginia Tech. The Hokies (10-2) have a Thursday matinee against North Carolina A&T for their final non-conference tune-up before they visit the Carrier Dome. The ACC opener will be a challenge for SU’s defense, as Virginia Tech is third in the nation in three-point shooting at 45.3 percent. The Hokies average a gaudy 92.6 points per game and have topped 85 points eight times, including in a 93-86 loss to then-#8 Kentucky. Five different players average double figures in points for VT, and four-fifths of that group shoot over 42 percent from three-point range while making more than one trey per game. Ahmed Hill leads both categories for Virginia Tech at 16.5 points per game and 3.1 threes per contest while shooting 52.1 percent from deep, and has made at least five threes in four different games this season. The Orange and the Hokies will do battle on ESPNU at 6:00pm Eastern on Sunday. The telecast will also be available online at ESPN3.com.